Here is something that is slightly interesting, maybe. 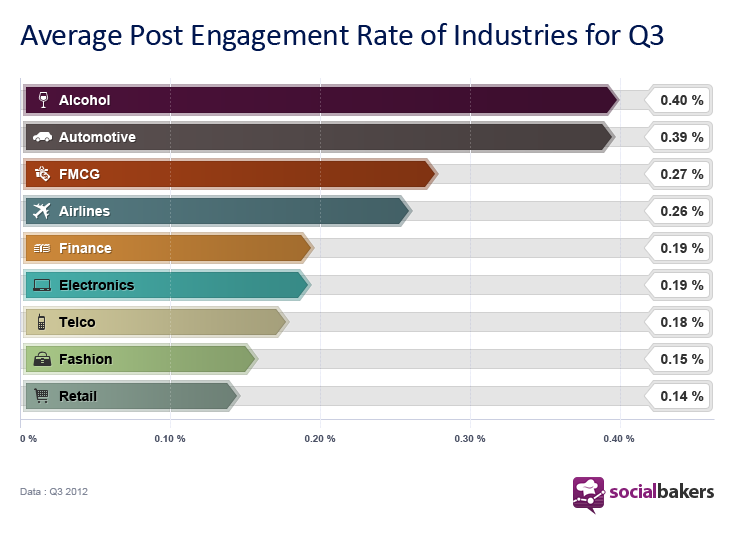 socialbakers have looked at engagement rates on Facebook pages and compared the results by sector. The thing that caught my eye was not the difference between setors and possible reasons for this, it was the actual rates themselves. The most ‘popular’ sector, alcohol brands, had an engagement rate of 0.4%. This may be a high result in relative terms, but in absolute terms it seemed very low. My wife used to work for a leading DM agency and I asked her how a response rate of 0.4% would be viewed. Her answer, “pretty crap”. Bear in mind, also, that response to a DM campaign would involve doing something like actually buying the product,or subscribing to an offer, rather than pushing a button saying ‘like’ or ‘share’. Now, admittedly, it costs more to run a DM campaign than it does to publish content to Facebook, but doing things that get a poor response just because it is cheap doesn’t sound like a good business case to me. So, remind me again, why are we all so obsessed with Facebook and ‘engagement’? Hi Richard, great insights and observation. You are right what is the obsession with FB and engagement…? Moving deck chairs on the Titanic is what it feels like to me. Perhaps getting a “like” is easier than getting the sale, but what about getting the relationship… long way to go. Indeed. The problem with ‘the relationship’ is that the relationship brands want with consumers is different from the relationship consumers want with brands. And many brands just can’t get their heads around this.